How far you’ve come ! Welcome to episode six. We’re half way though the first season now and I think it would be a great idea at this stage to have a brief recap of the progress you’ve made over the last two and a half hours. Because in an incredibly short time, you’ve accomplished an awful lot and you may not be aware just how far you’ve come. I introduced the concept of cognition and explained that there are two types. Conscious cognition is where we actively think about something and unconscious cognition is where our brain goes to work on our behalf in the background, while we’re doing something else. I explained how walking stimulates this latter unconsious cognition and helps us generate ideas and solutions. We talked about how the writer Jean-Jacques Rousseau, on his solitary walks around Paris, formulated the ideas that inspired not just the French Revolution but, much later, the development of cognitive behavioural therapy: a way to change the way we feel by taking control of our cognition — changing the way we think. 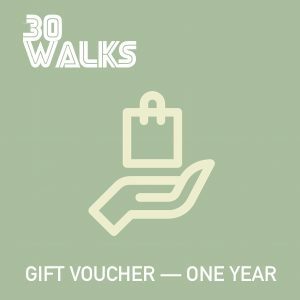 I also mentioned how I’d had the idea for 30 Walks after a dissonant experience working for an online diet guru who preyed on people’s unhappiness. On my own initiative I spent time helping his customers feel better about themselves and later, while walking the streets of Paris, realised that I could share the advice I gave them with a wider public. And that — I hoped — would also help me feel better about having worked for such a toxic person. I highlighted the dualities we all live by, where the social roles and responsibilities conferred upon us may not fully tally with what I called the “true self”. That’s just a handy term for the person we are when no one needs us and when no one’s looking. In my case, I’m much closer to the six year-old version of myself scouring the tidelines for treasure than the father, partner and business owner I need to be each day. I encouraged us to visualise a happy and carefree version of ourselves that, of necessity, we abandoned sometime back before we began acquiring the responsibilities we have today and suggested we find ways to “go back” and bring that version of ourselves along in order to live more mindfully through our daily routine. I introduced easy ways to begin new habits that made us feel happier, identifying the things that give us joy and scheduling them into our daily life. We talked about how to choose what we would focus on in life — how to give ourselves permission to filter out “chatter” from the radio of our egos and quieten our minds. I pitted the enabling force of personal agency against the temptation of victimhood. It was all about recognising not only the scope of your personal power but the responsibility we have to ourselves to exercise that personal power each day and not reassign it to others. This is essential in banishing those who would profit from controlling us, whether they do so for money or for other other reasons. Key to realising our personal agency is resisting magical thinking and instead making choices to change our situation. In so doing we shift our locus of control closer to our own sphere of influence and become the makers of our own destinies, designers of our own futures. I explained in detail how we can use one of the key tools of cognitive behavioural therapy — the cognitive triangle — in our daily lives to actively change the way we feel about things, by taking actions or modifying our thoughts. The key concept here is that cognition always precedes feelings: unhappy thoughts lead to unhappy feelings. Just as we can benefit from positive unconscious cognition to solve problems, negative cognition can make us feel unhappy or anxious. Using the cognitive triangle, we can strategically modify our cognition to alter the way we feel about things. We looked at how important it is not to try to be perfect and how essential it is not to compare our own efforts in a certain field with those of the 0.1% most celebrated exponents. The implicit message in this, which I hoped would work on you as you walked was: despite the way we use social media, we are not in fact on stage, we are not performing a show for others, this is our life and we must live it for ourselves not for what the audience may or may not think of us. I also talked about the idea of zero-sum conflict games and how they can lead to the fallacious and damaging idea that any given situation has a winner and a loser. Highly alienating, when all we really need to do is connect. We talked about how anxiety around the idea of “losing” in social transactions causes us to try to win them by projecting perfection. Right, let’s get on with today’s episode. I grew up the youngest of three siblings. My brother and sister were quite a bit older than me and, when I was still watching Captain Caveman, they listened to Iggy Pop and talked about politics at dinner. My dad tutted at news items about the economy. I had literally no idea what was going on with any of these people, but between my lego robo-destroyer and I, which could talk, we were fairly sure that when we needed to know, a grown-up would give us the missing information and the key to the grown-up instructions. Until then … stare out of the window, watch birds, make lego. Well, damn it all if I’m not still staring out of the window at 46, waiting for the instructions. I’ve walked into most situations in my life — from jobs to dinner parties to romantic relationships — under the assumption that everyone got the memo on how to do it, except me. I assumed I missed it from staring out of the window. I’ve muddled through regardless, sometimes failing, sometimes succeeding. But until relatively recently, I genuinely believed I was working with sub-par information on most things. I’d like to tell you about the most uncomfortable social encounter I ever had. In the year 2000 or so, when I had only recently begun working full-time as a reporter, I was sent to cover a conference. The timetabled sessions were straightforward enough. I just sat in my chair and wrote down the salient points. But the bigger challenge came in the bar afterwards. You see, the real work of a journalist depends on building off-record relationships and it was up to me to go out there, make friends and network. Now, if you’re anything like me, the phrase “make friends and network” has a physical feeling and that feeling can best be described as the cold hand of death pulling out your lungs, liver, pancreas and heart. You see, I’m one of life’s natural introverts. Or at least, that’s my tendency. Let’s just quickly bust a myth about introverts. Introverts love people, we just need to deal with them one or two at a time. Extroverts, our thigh-slapping, loud-talking cousins, derive energy from social encouters. The more people are involved, the more energised they feel. Why don’t we all meet up and go together, they holler. Let’s have a company barbecue and bring your spouses and children. The more the merrier, they boom. Extroverts actually find one-on-one situations intense and taxing and convert them to groups wherever possible to keep things light and jolly. Introverts, on the other hand, are the opposite. They derive their energy from solo time and one-on-one encounters and actually have their energy drained by group social interactions. The more people are involved, the more energy is drained and the more they need to go off on their own for a bit to recharge. So for an introvert, a room full of people all clinking glasses together in cliques with boisterous bonhomie, is, well, daunting to say the least. There are junctures in your lfe, I feel, when you have the choice to follow one train of thought or another. I could have listened to the natural introvert in me saying, this is not your scene, and simply run away. I would have been spared a very uncomfortable and draining time. But firstly, I didn’t know I was an introvert. I hadn’t thought about it much or allowed myself to feel legitimate discomfort in group social situations. At that stage I still just thought I wasn’t … normal. Moreover, I believed I would have failed in my job, if I had bolted. If not that night, then in the long run I would have failed. So I chose to lean in, towards the thing that terrified me. I decided … to fake it. I got the tight-smile and the turn-away. It’s straightforward enough an instruction to give. It’s not unreasonable. They just meant, don’t give away our secrets, don’t blab about anything that will harm our relationships with out customers and suppliers. No one thought, or cared, when issuing this instruction that this would mean one human reporter would spend a horrible time being socially shunned. In any case, diddums, it comes with the territory. If your hide isn’t thick enough, don’t take the job, right? At some point I managed to shoe-horn in a few awkward exchanges with some poor guy, before he was joined by his colleagues, at which point he did his best to get rid of me. But I just glommed onto them, like a grinning limpet. Playing the role of the thick-skinned. The man turned his back on me pointedly and yet, despite this lancing humiliation and very clear rejection, I somehow managed to strike up a chat with someone else in the group. This person was warmer and soon she had brought in someone else. We clicked and all of a sudden the three of us were dominating the conversation and laughing and — now — the man who had tried to freeze me out wanted into our little circle. I could see him looking over his shoulder, head bobbing like a chicken, trying to find an opening. Which was hard because of the firmness with which he had turned his back on me. So I pulled the ultimate baller move. “Karen, Stacey, I want you to meet Jeremy,” I said, placing my hand on the arm of the guy who had frozen me out and bringing him into my group. And that was it. I had effectively changed the narrative around who I was in that room. I was no longer the pariah, knocking at people’s doors, begging to be let in and enduring their shallow and suspicious rejection. I was now a connector. It was a major moment for me because I suddenly realised that I could decide to play a different role socially to that which came naturally or to that which was foisted upon me. Had it not been for the job and my determination not to fail at it, I probably would never have dared to step up and fake it like a man. Over the following 12 months I had many more opportunities to put my new discovery into practice. After a while I discovered that I was no longer faking it. Somehow I had managed to automate the actions and reflexes such that these interactions came naturally and no longer made me so uncomfortable. About a year after that conference I went to interview the new managing director of a company and we hit it off. The following week that same conference came around again I ran into him on the first evening, looking sheepish in a corridor. I was surprised. But I don’t know why. After all, people are only human — even those more accomplished than you — and we all end up having to solve the same problems at some point. “That would be great,” he said. So we went back down to the bar and I spotted a gregarious publisher with an amazing flair for social networking. He completely understood the game we were all playing and I knew that if I presented Niles to him in the right way, he would pick up the baton and get him integrated. So I made the connection and off they went: Niles standing upright, work face on, shaking hands firmly and so on and so on. The third year, an industry friend had brought one of her promising young managers to the conference for the first time and I was standing with him nursing a pint. “Look at them all,” he said. We live in strange times when it comes to what’s fake and what’s authentic. Recent years have blurred the boundaries between real and unreal, first with technology. The ubiquity and cheapness of image manipulation software gave rise eventually to backlashes against “fake” images. Not just in fashion photography —where presentations of unattainable and preternatural body shapes, bone structures and skin composition made a strong case for more authenticity — but eventually in everything. Almost any artistic or professional embellishment or refinement process gained detractors. Suddenly millennial journalists were writing phrases like “full disclosure: this interview has been edited”. Well you would hope, right? Otherwise you’ve not really done your job. But it showed a changing landscape and attutude towards truth. We’re now living in an age of fake news, in which propaganda, misinformation and old-fashioned lies are dressed up and trotted out as current affairs. The fakers are accusing the truth-tellers of being the one’s faking it until everyone’s moral compass is compromised. No one is sure where North is anymore. So I can understand if there is some resistance to the idea of “faking it”. “Just be yourself,” is advice you are far more likely to hear and while the sentiment behind it — that you will make better connections if you are coming from a place of authenticity — is solid, there is one major problem with this advice. What if being yourself means messing things up? What if being yourself means hiding in a corner instead of smiling and making connections, because that’s just who you are? What if being yourself means being cynical, sarky or passive-aggressive when going along to get along will get you further? What if being yourself means cheating? It’s like the frog and the scorprion isn’t it. Remember that story? A frog and a scorpion meet by the side of river. The scorpion asks the frog to carry him across the river on his back and the frogs says, “No way, you’ll only sting me”. Well what if being yourself means you’re a scorpion, always hurting those who help you? Or you’re a frog, always getting ripped off and burned? It isn’t always appropriate to be the self that you genuinely, authentically are, because sometimes we are our own worst enemies. I’m not saying pretend to be something you’re not. I’m not advocating becoming a charlatan and misleading people — far from it. What I’m saying is, who and what you legitimately are is not set in stone. You can change what you are and you can do it using the techniques we’ve studied so far in the 30 walks project, which is partly why I ran through those recaps. Did you know that the phyical action of smiling releases endorphins — hormones that make you feel happy — and reduces cortisol, a hormone that contributes to negative feelings? And your brain, awesome though it is, can’t tell if a smile you make is real or fake? It’s the muscle movement that counts. So you can literally smile yourself happy. It sounds like the worst kind of platitude, but actually, if you’re feeling fed up, smiling is a fantastic cure. If you get into the habit of being someone who smiles, you will become a happier person. It is literally a case of fake it till you make it. I’ve actually done this and it works. And you know what they say: smile and the world smiles with you. Smiling increases the happiness of the people around you. So smiling will help to create a better environment for yourself. When people around you are happier they will be nicer to you. You’ll create a positive feedback loop. It may sound glib — but that’s mainly because I’ve written it that way, and I’ve done that deliberately because I want you to understand how trivial and easy it is to do. It won’t take any effort to do this. But the effect is far from trivial. It will turn your life upside down in a good way and you’ll literally flip out over the control you can have over your own feelings. Try it with smiling. Every day for a month wake up and smile at youself in the mirror like a lunatic for two minutes. You’ll have a happier day. If you feel very unhappy and don’t feel you have anything to smile about, that’s OK. Just do the motions with your face. Force it. You may feel tight, like it’s a real strain to hold your face in such an unnatural or unwarranted position. But you’re going to persist anyway and gradually you will feel your muscles soften. You may even start to feel ridiculous and this may even make you laugh. See. Caught you out. Conscously try to smile more, during your days. Do it even if you feel like a fraud for doing it. There’s no downside to a smile, so it doesn’t matter if you are a fraud. Just do it. Smile at the bank teller, smile at the waitress, smile at the bus driver, smile at your boss, even if you hate him. Especially if you hate him. See what kind of month you have. Watch what effect it has on success levels. Smiling people are seen as more successful and as a society we tend to reward successful people with more success. Watch people fall over backwards to help you, watch people smile back and lift your day. Feel that beautiful and simple connection. Feel part of a community. Now bring that experience to bear on other things you’d like to change. Obviously, the process of changing who you are, like we saw in my story, involves consciously adopting new behaviours that are not natural and authentic to you. Not to begin with, at least. But in adopting and deploying these new behaviours, you will establish new habits that help you achieve what you need. But more that that, once you experience even a small success with this, you will shift your locus of control a degree closer to your own sphere of influence, helping you to feel more incontrol of things generally. So it’s a process that is self-reinforcing and self-expanding. I made it sound glib, because I want it to be easy to start. But don’t be under the illusion that self-change is rapid or easy. It isn’t and it requires time, resolution and self-discipline. But it works. So you can go into it at least with certaintly that you will get a result if you don’t give up. I’ve talked this time about when it’s appropriate to fake it. But as you saw I wasn’t saying we shoud be false towards people, I was saying here’s a way to train ourself to be legitimately smiley. In the next episode I want to talk more about what gives us legitimacy in daily life and how we can “be ourselves” — what it takes to be truly authentic. When I was a kid I thought there would be some special point in my development when the secret of preferring David Bowie to Captan Caveman would be given to me. But actually it just involved taking the time to properly listen to my sister’s records and experience the incredible, mind-blowing jolt to the imagination that his music provided. Taking the time to expose myself to that work and give myself the gift of experience. It helped with discernment and touched me deeply, in a way Hanna Barbera cartoons no longer could. It didn’t happen to me: I did it. When I was a kid I thought there would be some special time at which I would be officially adult and, at that time, someone would take me aside and give me the secret information about why supply-side economic policy causes wage stagnation and ends up causing its own downfall. But that never happened. I had to do the work. Read about it. Ask people. Fail, fail better and eventually get it right. Turns out, there are no grown-ups. No one actually knows what they are doing, we are all just working hard and getting a little out of our depth, until … we can touch the bottom with our toes … and then we edge out a little deeper. Go on. Take a step.